With its back drop of rugged mountains, dotted with orange trees and white washed villages, Benidorm is one of the most famous and deservedly popular resorts in Spain, renowned for its wide avenues, fine sandy beaches, lively nightlife and superb 'all year round' climate. Our hotels are located in the Levante Area with its fabulous beach, vibrant nightlife, attractive sea-front promenade, bars, shops, restaurants and twice-weekly market (Wed/Sun). 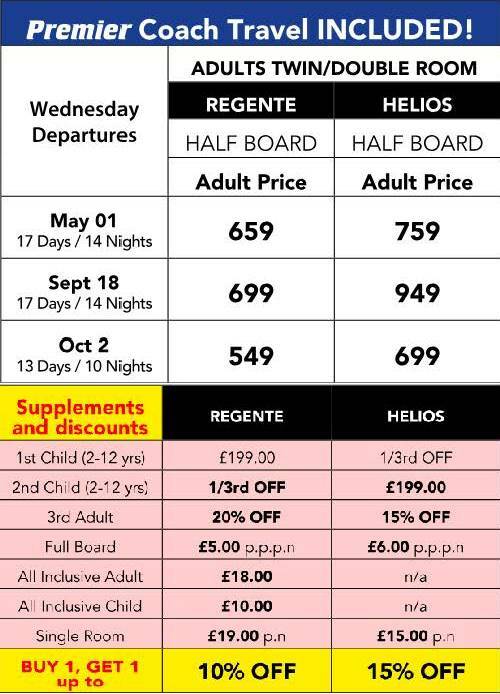 For a taste of the 'real Spain', Benidorm's Old Town is within easy walking distance of all our hotels or a short hop on the local bus service. In the old town you will find narrow atmospheric streets filled with shops, bars, pavement cafés and, of course, visit to Benidorm's famous 'Tapas Alley' is an absolute must! Please note: On your homeward departure you leave before 8.00am, therefore missing full breakfast.